The spread of computer and internet has brought innovative changes in the field of education. Most of the educational institutions are widely using the possibilities of internet to communicate with students and teachers. 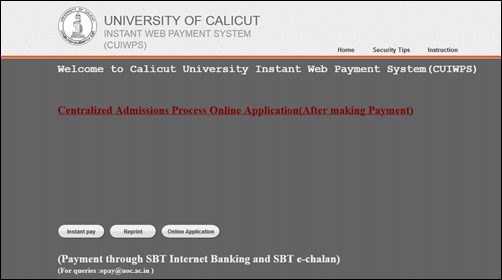 Aiming to bring the students much close to the institution, the University of Calicut has brought an inventive system which will be time saving, cost effective and transparency in admission. Even though the Centralized Ranking Process (CRP) was initiated last year, it was only a partial success. But now through the Centralized Admissions Process (CAP) 2014, the University aims to make the procedure simple which can be handled with ease. Through the Centralized Admission Process (CAP), students can submit application online for admission to various degree programmes in multiple colleges affiliated to the University. Being new to the system, each student should have a clear knowledge about the admission procedure. Except UG programmes to which admission is based on entrance examinations and BA Afsal-ul-Ulama, the admission to the UG Programmes in Arts and Science colleges which are affiliated to the University of Calicut is being conducted through through Centralized Admission Process for the Academic Year 2014-2015. As per the Centralized Admission Process (CAP), students can submit online application to various colleges and programmes. This simple online facility is available in CAP website www.cuonline.ac.in. This online allotment process provides the candidates an opportunity to obtain admission at any one of the affiliated college of his/her choice on the basis of merit. Before proceeding to the registration process, students much read and understand the details given in the prospectus. The online registration under CAP will be done in two Phase; online payment of fee and online submission of application. As there are two modes of payment process, it is very important to know it in detail. For the procedure, students should enter the date of birth, mobile number, E-mail and a fee of Rs 100/- for General category and Rs 50/- for SC/ST should be entered. The url https://www.uoc.ac.in can be used to pay registration fee. Do following the payment procedure given about State Bank of Travancore online. After taking the printout of the online payment 'receipt', the University challan number and security code will be received by SMS/e-mail which can be used to login to CAP and complete the online application process. While regarding the payment through E-Chalan of SBT, a SMS will be received within 2 to 6 hours after the remittance of amount in any SBT branch. The candidate's copy of the chalan should be kept in hand while the CAP ID number and password would be received through an SMS/e-mail. As the payment procedure is completed, now the candidate can proceed to the online submission of application. Enter the CAP ID number and password received in your mobile. Later submit the other basic details like the copy of the qualifying certificate, passport size photography and list of colleges and programmes of according to personal choice. After the preliminary registration process, students should have to submit the personal details, educational details, choice of college and finally details if applicable for community Quota/ Management Quota/Sports quota /Person with disabilities. The registration gets completed at this stage. There is need to send the print out of the application/documents to the University but all the originals should be presented at the college during the time of admission.